Wow! Just WOW! This event was a m a z i n g .Cabana Pool Bar on Polson St in the Port Lands, with its breathtaking view of the downtown core across the harbour is a unique A-List venue in Toronto. The place seems so European to this author, and that includes the food, furniture and overall facade; this liquor licensed attraction is wonderfully multicultural and yet magnificently Canadian. The gorgeous wooden cabanas with stunning white drapes and cushions ringing the large sapphire coloured circular pool breeds a natural excitement and creates an appetite for summer fun. This is also a great place to go people-watching and trend spotting. Bikini fashion matters here, and young bodies are on display all through the summer months. 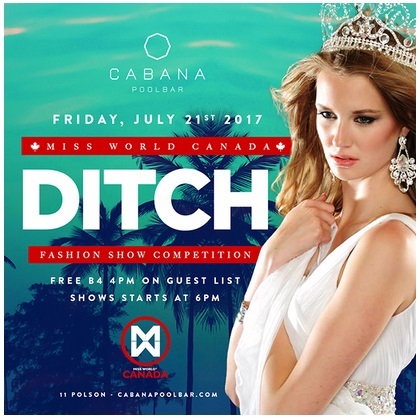 So with all of these elements combined, this really was the absolute perfect setting for the 2017 Search for Miss World Canada Runway Fashion Show. The weather that Friday evening was perfect and the pool bar was packed. There’s some spectacular video from this day and more and more keeps turning up on YouTube. This piece below by TrueBlueEntertainment surfaced ten days after the show. Backstage, Modern Makeup Jennifer Turner was applying last minute touch-ups to all fifty-seven nervous performers. This author believes the face brush ritual is more about calming nerves as much as it’s about improving anyone’s appearance – it confirms they’re perfect. Many of the participants, although becoming more and more comfortable appearing in appearing in public and facing large crowds alone on stage, had never modeled clothes on the runway before, not really, and not in bikinis in such a bizarrely cool setting as this… They were all nerves. All fifty-seven Regional Delegates from the 2017 Search for Miss World Canada rocked the house! 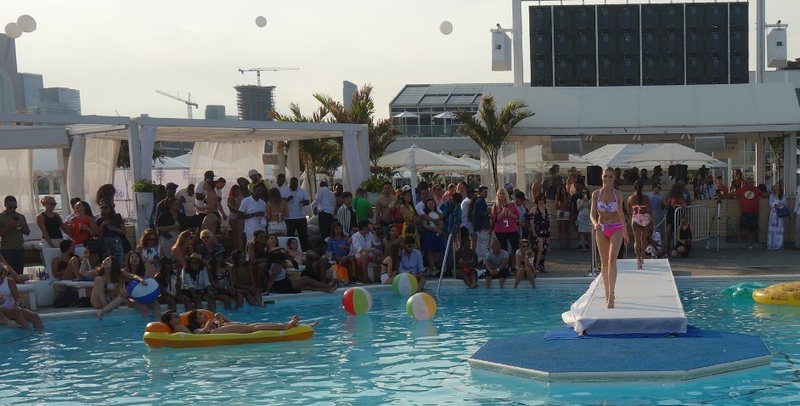 The show started with Rachel Sin – the models appeared dressed in outfits for around the pool. Some of the fashion was more formal than people expected. One male heckler shouted out loud, ‘She’s all business!’ when one of the garments was a lovely beige business casual jacket and skirt. And everyone laughed because the comment expressed aloud what they were thinking – the business jacket seemed outside the mandate. But the confident young lady, (I think it may have been Sravya Kalyanapu – 2017 Miss Northern Alberta World) to her credit, kept walking the runway and killing it. She did great and her outfit was dashing. Dressed in Rachel Sin these young models held everyone’s attention like nothing else could. 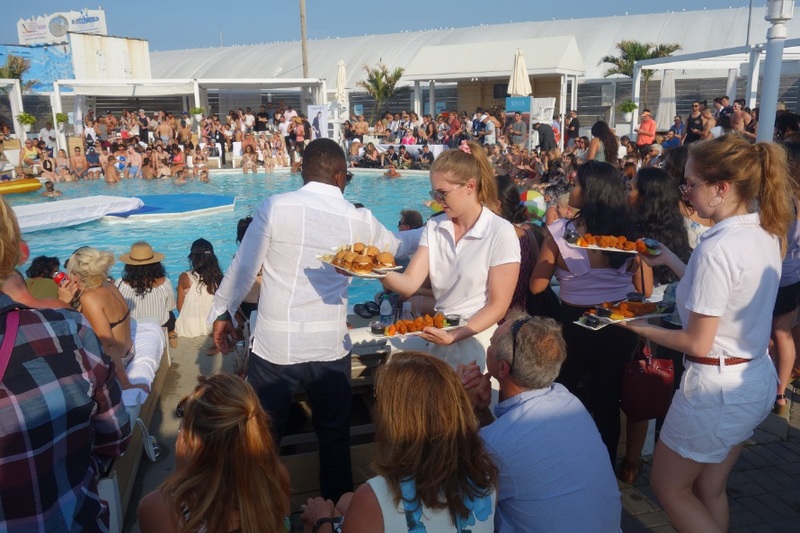 The panel of judges was only watching the models; they ignored the swimwear and the music and the cheering crowds to focus entirely on the candidates. As the delegates walked, the dignitaries watched and scrutinized every step they took on that white cloth draped plywood catwalk. Every facial twitch and expression was measured and appraised. The center island at Cabana pool bar is a spongy blue AstroTurf perfect for relaxing in the sun, but not so great for ladies in high heels doing a runway fashion show. The blue island at the end of the white runway was the penultimate pool bar trap; the second last obstacle before a catastrophic splash. But fortunately, none of the ladies fell into the pool that Friday. All of the runway models made eye contact with Judges at least once in their walk, and none of them smiled – all except one. Hah! It was a scandal. After the clothes by Rachel Sin, it was time for the swimwear fashion by Sisia. The crowd was very receptive to all the models, but Miss Southern Ontario, and Natalie Allin (miss British Columbia) and Karema B got the most applause, regardless of what they were wearing. Then it was time for Jennifer Turner of Modern Makeup to come out front and shine. Hey photographers, you’re missing the shot – its behind you! There is so much media from that day… because it was a m a z i n g.